A Wellness Essence (WE) Session is an Extraordinarily Streamlined, STATE-of-the-ART QUANTUM HEALING Process! After many years of contemplating the most appropriate fee to charge for a Wellness Essence (WE) Session, I have chosen to implement a sliding scale. Those experiencing healthy financial flow are encouraged to pay at or toward the top end of the scale; while those experiencing financial hardship are welcome to pay at or toward the bottom. Those in between may walk the middle path. :) I trust all clients will honour this privilege and pay according to their present means. 7. Optimal Resolution of "Unfinished Emotional Business" in order to get "Unstuck"
Contact US to Book Your WE Session Now! 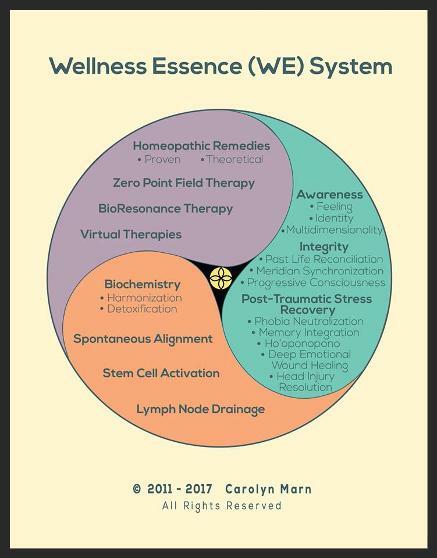 A Wellness Essence (WE) Session works on all 4 levels of Quantum Healing: Preparation, Unconscious Processing, Sudden Insight, and Manifestation. Occasionally an adjunct therapy such as Electroherbalism, PEMF Therapy, Aromatherapy, Sound Therapy, or Auriculotherapy using Coloured Light is also recommended for the Manifestation Stage (In order to ground and maintain the new state of consciousness realized; and, to help heal lingering (chronic), painful physical manifestations of the old state of consciousness. A Holistic Health Consultation can encompass a very wide range of wellness issues such as customized personal nutrition, fitness, supplements, sleep, water consumption, conflict resolution, stress management, relationships, fertility, constitutional homeopathic remedy, (chronic) pain relief, and optimal therapy/practitioner recommendations. 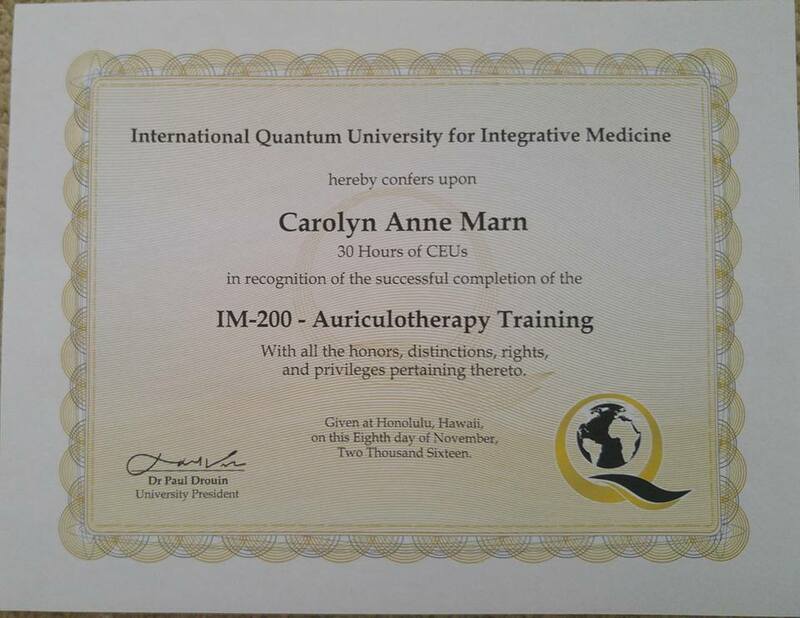 Carolyn Marn, HHP, has studied and practiced Psychology, Wellness & Lifestyle Management, Patient Care, Professional Ethics, Interpersonal Communication, Nutrition, Quantum Healing, Quantum Physics, Homeopathy, Brain Gym, Aromatherapy, Ayurveda, Electroherbalism, German New Medicine (Hamer Medicine), Auriculotherapy, Colour Therapy, Crystals/Gemstones, Usui Reiki, Massage, Integrated Energy Therapy, Advanced BodyTalk, BodyTalk for Animals, Linking Awareness, Yoga, Tai Chi, and Various Spiritual Approaches to Spirit-Mind-Body Wellness. 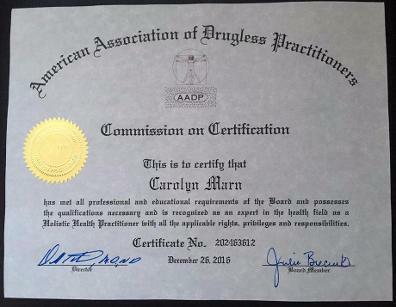 From 2011 until 2017, she founded and developed the Wellness Essence (WE) System; and, in November 2016, completed a Bachelor of Holistic Health Sciences & obtained Certification as a Holistic Health Practitioner (HHP) from the American Association of Drugless Practitioners. As far as life experience is concerned, Carolyn has been through many transformative experiences including: surviving life-threatening illness as a child; serving on a jury in a criminal case; running for federal public office; experiencing natural & induced, home & hospital childbirth; parenting 3 gifted sons; navigating 2 amicable divorces; serving in the conventional medical vocation of nuclear medicine technology for 24 years; co-creating & maintaining a successful marriage; navigating mid-life issues including Kundalini Awakening, Uranus Opposition, & Chiron Return ; immigrating to the USA from Canada; extensive travel across Canada, the USA, & Europe; being present & vigilant with each parent as they departed their earthly bodies; and, attending 2 week-long silent retreats with Adyashanti. Holistic Health Consultations are offered, by appointment, in increments of 30 minutes. Appointments are facilitated Worldwide via Skype, Facebook Video Messenger, or Telephone. Holistic Health Consultations work at 3 of 4 levels of Quantum Healing - the 1st (Preparation), the 3rd (Sudden Insight) and the 4th (Manifestation) A specific discussion of personal wellness issues can be the first step used to learn and to develop a progressive wellness plan; or, a final step used to tie multiple healed facets together and ground newly-integrated realizations. In the interim, a Holistic Health Consultation can be a source of new information and/or alternate viewpoints - often resulting in an "aha" moment which shifts consciousness, which in turn shifts reality. Resonating Wellness began practicing electroherbalism, using the Spooky² Remote Rife Machine, 3 years ago. We began learning from an MD in Northern Georgia who had worked closely with Robert O. Becker, author of "The Body Electric". 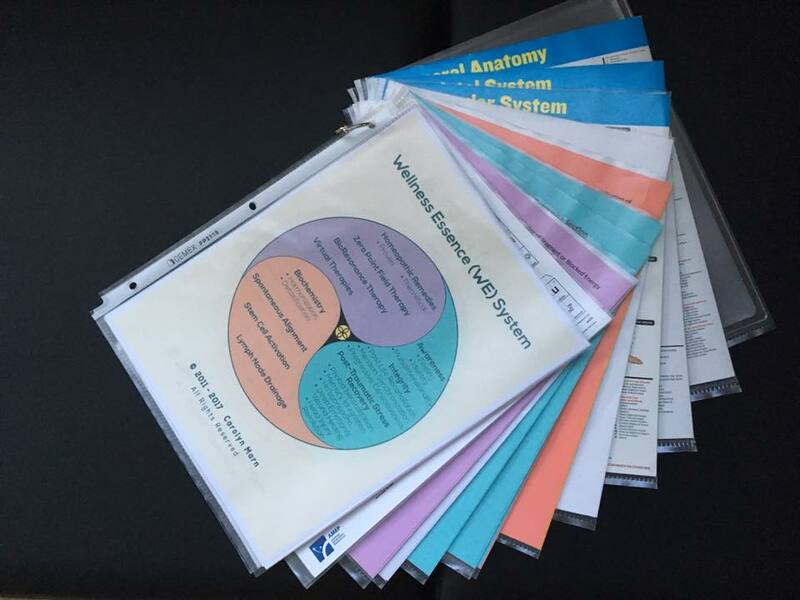 The Spooky² software offers more than 6500 frequency sets from multiple databases, for healing various conditions; plus, allows for customized frequency sets to be compiled and stored. Resonating Wellness uses the Spooky² Rife Machine (frequency generator) in a remote capacity - which is a mode of transmission using the principles of quantum physics and the antenna properties of DNA to transmit through what physicists call nonlocal space. A DNA sample - usually a few fingernail clippings - is obtained from the client and placed beneath the plate of the magnetic remote device. Next, the optimal program - frequencies, waveform, voltage, timing, and sequencing - for the client is determined and implemented. Usually, the run time for a customized program is about 5 hours. You can begin to see the benefits of using the system in a remote capacity - no need for the client to sit holding metal electrodes for 30 minutes or more at a time. The client can be in the same room or on the other side of the world! 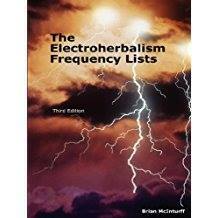 Electroherbalism works at the 4th stage of Quantum Healing : Manifestation. It is often used as an adjunct to a Wellness Essence (WE) Session, in order to firmly ground and sustain the positive shift in consciousness attained. 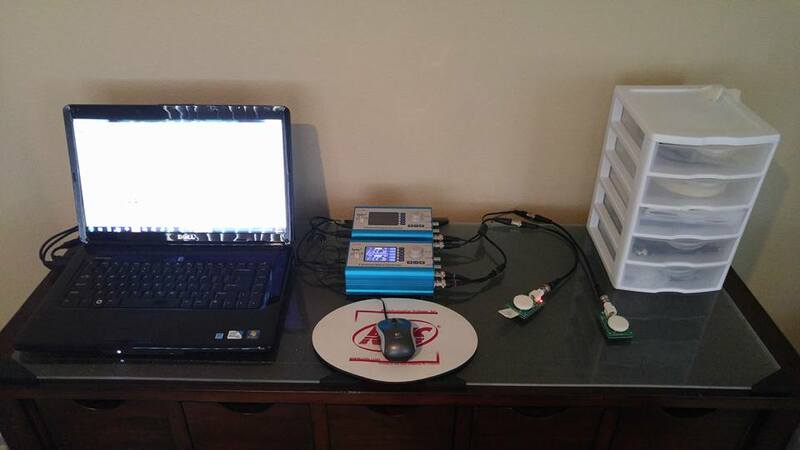 Using the Spooky² Remote Rife Machine is also a useful way to introduce specific healing frequencies into the human or animal bioenergetic field. It is particularly useful for detoxification purposes; and, in helping to resolve stubborn, longstanding (chronic) degenerative conditions and infectious diseases such as Lyme, STD's, absesses, and AIDS. Usually, a total of 3 Remote Rife Sessions is required. Clients must send or drop off a DNA sample (fingernail clippings) to our office. The same DNA sample is used for all 3 sessions. The fee for this service is $125 US for all 3 sessions. The foundational cellular healing power of PEMF therapy has helped many people with conditions such as arthritis, diabetes, post-stroke recovery, traumatic brain injury, multiple sclerosis, psoriasis, and many more conditions and diseases. 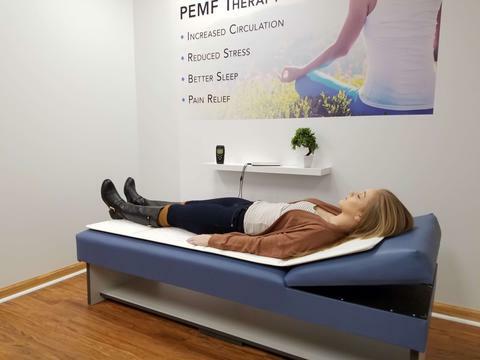 Resonating Wellness will be happy to answer your questions both before and after you purchase your PEMF product from PEMF Supply. We have compared similar products from other companies, many with MLM or network marketing structures; and, have determined the Vasindux PEMF Products to be the best overall, at the most affordable prices! Pets also benefit greatly from PEMF therapy, as they are often absorbing deleterious energies from their owners and "dirty" electromagetic energy from the environment. 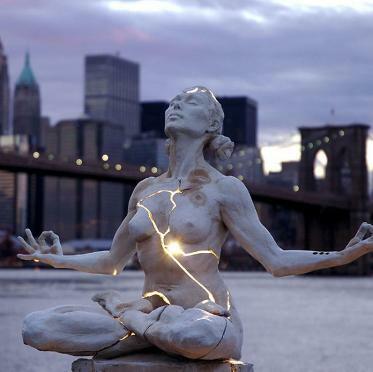 PEMF Therapy works at the 1st and 4th levels of Quantum Healing - Preparation and Manifestation, respectively. PEMF Therapy is a safe, effective, integral part of a foundational wellness routine. It helps to restore and maintain your vital Resonance with the Earth's Electromagnetic Energy that typically becomes degraded as we age, use cell phones, wifi, microwaves, and the like. PEMF Therapy is also a safe, effective, affordable option for chronic pain relief, treatment of degenerative conditions, and palliative management of conditions that are not responding well enough to various forms of natural and/or conventional therapy. 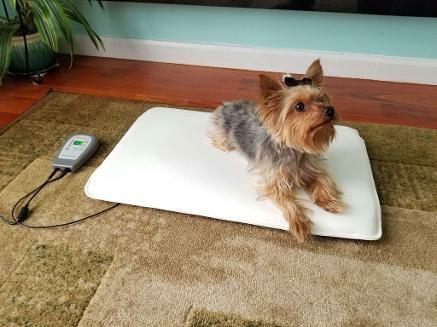 Note: If you are unable to lie on your back on a firm surface, the Vasindux PEMF mat may be placed over you as you sit or lie comfortably in your favourite spot. 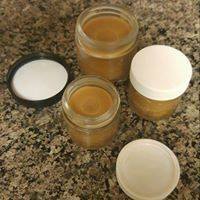 Using the finest organic and/or wildcrafted essential oils, hydrosols, and carriers from Aromatics International, Resonating Wellness prepares customized aromatherapeuitc products including essential oil topical (in jojoba oil) and diffuser blends, inhalers, salves, lotions, and ointments. 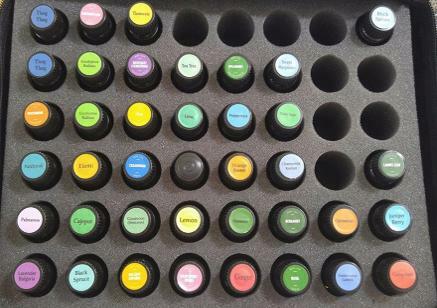 We have more than 60 essential oils - plus numerous hydrosols & carriers - "in house", in order to manifest very specific individualized formulations into the exact right product for each individual client. If you live at a distance; and, have or are able to obtain the raw materials yourself, we will be happy to provide the optimal, individualized, aromatherapeutic healing formulation (recipe) to you for a fee. Using the fine tip of the Chromalive Light Pen and the correct colored-film lens for the client, colored light is directed through a quartz crystal onto the exact reflex spot on/in the ear. The 4th edition Manual of Auriculotherapy by Terry Oleson, PhD, provides amazing 3-D images of the ear - accurately illustrating hundreds of precise locations, using both Western and Chinese Systems of Ear Acupuncture. This particular service is used for chronic and/or stubborn physical, emotional, and/or mental issues that do not resolve or do not hold resolution using consciousness-oriented approaches alone. In our practice, "Hands-on" Colored Light Auriculotherapy is implemented for the manifesting/grounding level (Stage 4) of Quantum Healing. provided 24 hours notice is given.